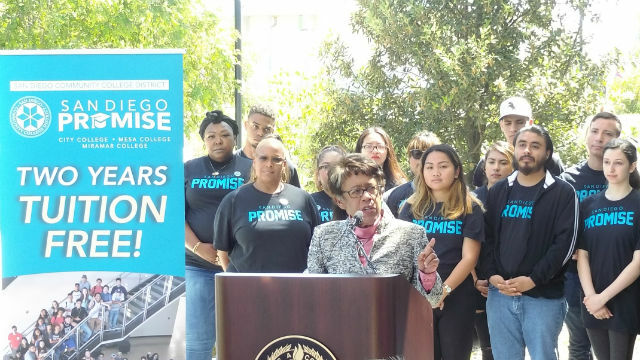 All San Diego high school graduates who are first-time college students can receive free community college tuition under an expansion of the San Diego Promise Program announced Monday. The district estimates that as many as 3,500 students may be eligible for the program in the 2018-2019 academic year. To qualify, a student must be a recent California high school graduate, a first-time college student, study full time, and maintain a 2.0 grade average. Carroll was joined by Mayor Kevin Faulconer and San Diego Unified Superintendent Cindy Marten at Mesa College to announced the expansion. He described the program as an “investment in San Diego’s competitive workforce” and “a model that’s working” based on the success of a pilot program begun in 2016 with 186 students. The first students in the program have maintained higher academic averages than other students in the district. In fact, nearly 20 percent of Promise Program students had 4.0 averages. The expanded program will cost an additional $1.86 million over the next academic year. Funding will come from Assembly Bill 19 and fundraising by the community college district. There is a gala fundraiser scheduled for Sept. 20 with Mesa College graduate Annette Bening as the headliner.